Intended for operation in the greater North Sea market and utilising an environmentally friendly, fuel-saving diesel-electric hybrid propulsion system from Corvus, Edda Freya was designed with a focus on cablelaying operations, offshore construction and inspection, and maintenance and repair (IMR) operations. Having entered service, Edda Freya first went to work under the terms of a long-term contract with DeepOcean. In addition to the hybrid battery system Edda Freya’s environmentally friendly credentials are enhanced by the adoption of Siemens’ BlueDrive PlusC concept, which was implemented by Siemens in co-operation with Østensjø Rederi. 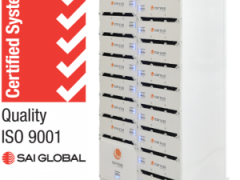 By using variable rotational speed with optimal operation of the diesel generators in combination with the Corvus ESS, the system will significantly reduce fuel consumption and the emissions of nitrogen oxides (NOx) and greenhouse gases (CO2 and methane). The use of selective catalytic reduction systems further reduces emissions. Also designed with a focus on excellent manoeuvrability and stationkeeping, the vessel has a vertical lay system (VLS) tower, skidding system for modules on the main deck, a launch and recovery system (LARS) for handling work-class and observation-class remotely operated vehicles (ROVs) and two moonpools for ROV operations. The vessel has 2,300m2 of deck space and is equipped with a 150-tonne dual tensioner VLS located over the moonpool, a 3,000-tonne carousel below deck and a 400-tonne active heave compensated knuckleboom main crane that can lift 600 tonnes in double-fall mode. The vessel’s accommodation capacity is 140 people. Edda Freya is a dynamic positioning class 3 (DP3) unit of SALT 304 design from Salt Ship Design in Norway and was launched by builder Kleven Verft on 15 August 2015. The vessel was delivered in February 2016 and went straight into the long-term contract with DeepOcean on delivery. DeepOcean had already secured work for the new vessel prior to its delivery on a project with Statoil and Wintershall. This particular project saw Edda Freya selected to install a riser for Statoil’s Kristin and Heidrun platforms in preparation for a possible tieback from Wintershall’s Maria development. Typical of the projects that the high spec, environmentally friendly unit can undertake is one awarded to DeepOcean Group Holding earlier this year for the provision of engineering, procurement, removal and disposal of the Varg subsea facilities. Awarded to DeepOcean by Repsol, the scope of work to be undertaken usingEdda Freya includes subsea pre-decommissioning survey, recovery of floating production, storage and offloading mooring lines, anchor piles, risers, midwater-arch buoy and subsea structures as well as onshore disposal and recycling of the recovered items. 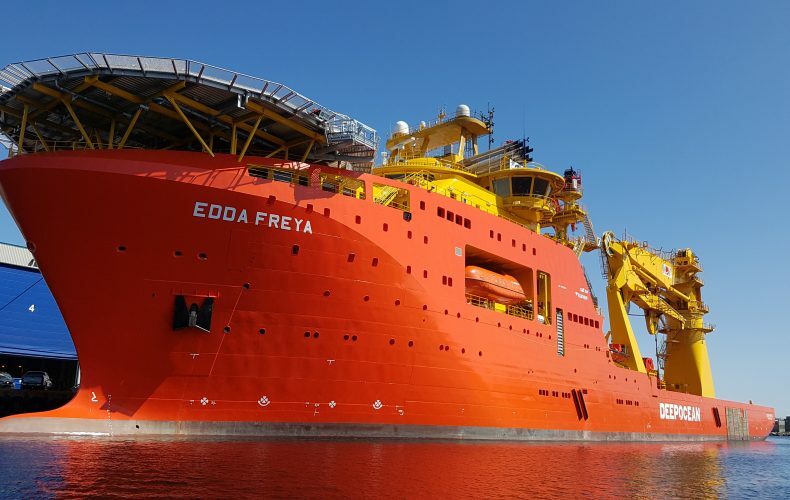 DeepOcean’s commercial director for subsea services in the Greater North Sea, Rolf Ivar Sørdal, noted that Edda Freya was specifically designed to carry out multiple subsea operations and hence provided a cost-efficient asset to carry out the project. Edda Freya is one of a number of vessels the Norwegian owner has decided to re-register, moving the vessel away from the Norwegian Ordinary Ship Register (NOR). Edda Freya, Edda Fauna, Edda Flora, Edda Fonn and Edda Ferd are all moving to the Norwegian International Ship Register (NIS). NIS differs from NOR in that it enables employment of foreign seafarers and wage levels established through collective wage agreements. Using NIS will reduce the company’s cost base but will mean Norwegian employees lose their jobs, although fewer Norwegian jobs will be lost than opting for a foreign flag. Several construction vessels have already reflagged to NIS in recent years.